I love Top Ten Tuesdays. I don't know why I don't participate in this book meme more often. I love love love making lists, especially book lists. 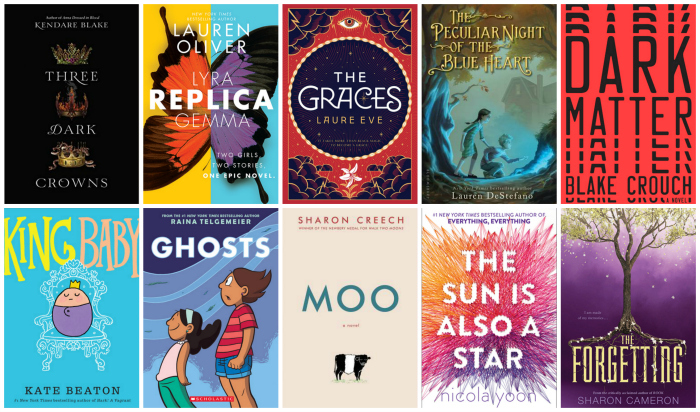 This week's TTT is about my most anticipated releases for the second half of the year. Obviously, this list does not encompass every single book I am excited about that is going to pub in 2016, but it's a good start! Luckily for me, I already have ARCs for most of these on this list. I wish I had copies of Moo and The Graces, but I'll just buy them when they pub. It's not as if I don't have enough books to keep me occupied in the mean time. At fist I thought Replica was two different books because the cover the ARC came in is in either yellow or blue depending on which way you hold it! Thanks for stopping by, Liselle! Three Dark Crowns is awesome, I hope you love it too! I'm also anticipating Replica by Lauren Oliver, I can't wait to read it ^_^ Great list! Hey Brittany! I just finished Three Dark Crowns. Really enjoyed it. 4/5 Stars! I just received The Graces and I think it sounds amazing! Great list! I realllllly want to read that one. I LOVE stories/retellings about the three Graces. Thanks for dropping by, Eva!